The Hurricane heater has been bolted into place by Nick. He explained how to lag the exhaust with fibreglass tape and left me to it. Apart from one false start where I omitted to leave one inch free of lagging at either end of the muffler, I think I did a reasonable job (for a first attempt). The exhaust is comprised of three sections; two lengths of flexible stainless steel pipe and the muffler. Each was separately lagged with the lagging being held in place by bands of 16 gauge wire. 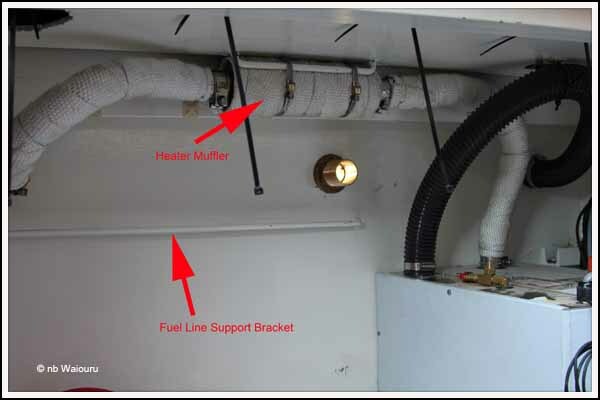 The exhaust system has deliberately been installed with the muffler positioned higher than the ends of the flexible pipe to prevent reduce the possibility of water entering the exhaust and getting into the heater. There is a metal rod underneath the exhaust which will be the support bracket for the diesel fuel line. The Hurricane has an hour meter on the main burner unit and a separate control unit, which I’m going to install in the back cabin. It also has a wired remote control on a 7 metre data cable which we will install in the saloon. 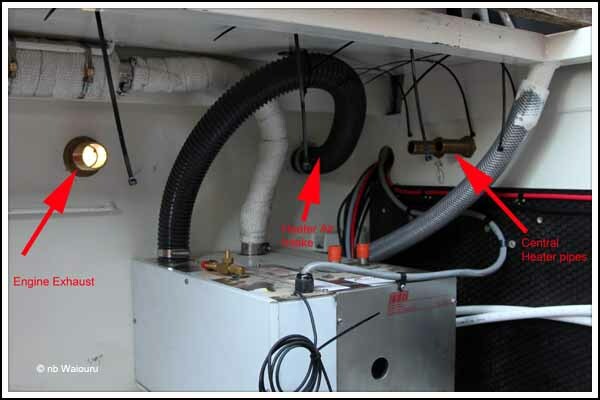 The black plastic air intake hose has been secured away from the exhaust pipe and again has the “highest point” above the height of the skin fitting. You may have noticed the wiring and plumbing connections have yet to be made. I’ve been looking at how we might control the heater using the Empirbus system. The Hurricane manual specifically states NOT to cut the power supply to the heater by installing a 3rd party switch into the system. It must be turned off/on using the switch on the remote control, which we will have in the saloon. The Hurricane has a timer controlled thermostat built into the remote control unit. This provides the ability to programme the heater so it starts at a set time if the temperature is lower than a set level. I’ve looked at the back of the printed circuit board on the remote unit and can see the soldered connections for the on/off switch. It should be possible to connect a wire across these two soldered connection back to the midships Empirbus node. We have a spare switch beside the bed that I’ve already wired to the Empirbus bow node. My idea is to program the Empirbus system so that when the switch beside our bed is pressed it activates the wire connecting the midships node to the Hurricane remote control on/off switch. Actually, taking this idea further; it should be possible to program the Empirbus system to activate the cable between the midships node and the remote switch by using the GSM module. That is; we should be able to send a text message from our phone to Waiouru telling the Empirbus system to start (or stop) the Hurricane. It also means the Hurricane can be controlled by the Empirbus master isolation switch. On leaving Waiouru all we have to do is press the one master isolation switch and know we have cut the power to everything (except for programmed exclusions such as bilge pumps, fridge, etc). Following your experience with the stove, and it's 'essential' 12volt supply, I'm wondering why Hurricane doesn't want a 3rd party switch involved. I understand (I hope correctly) that you intend to mimic the on/off facility of the remote control, but when you extend that to being a subset of the master switch I wonder if activating that switch could deprive the Hurricane of an essential 12 volt feed, perhaps to run an internal fan during a cool down period. I think if you are using the master switch as a mimic of the remote control on/off switch you should be OK. However, if the master switch also kills the power to the remote, and/or kills the power to the Hurricane main feed, you may create an occasional problem. As a last twist, suppose you shut down the Hurricane with the Master switch, what happens when the switch is turned on again? Does the Hurricane continue with the programme it was running before the power was killed, or will you have to switch it on or off, as required, as a separate action? David, The master isolation switch is really the "fail safe" switch when leaving the boat. All the equipment should really be individually switched off. You're correct regarding the switch in the bedroom mimicking the Hurricane remote on/off switch. Plenty of water yet to go under the bridge!